Wish you would post a picture of what you bought could not find one doing a search. I have an old craftsman’s l red handle 1” skew paid $15 on sale many years ago. Know it has a uniform thickness from ferrule to 45 degree bevel when bought it, now lot shorter. Was it new or used? Like Bill, a picture would be nice. If used it sounds like a re-purposed paring chisel. They are often tapered as they are not meant to be struck with a mallet like a bench or mortise chisel. They are typically longer both in blade and handle. Does it have a model number stamped into the handle? Someone could have ground it down and you wouldn’t necessarily be able to tell. All blades are ground, and most of us here could do a better job than the original grinds on economy tools. Someone could have even replaced the blade. Looks like inexpensive swap meet skew made from questionable steel but should work just fine. Plenty of examples of same on the internet and catalogs. I would take a file or take to grinder to round over square side edges to allow it to move smoothly over tool rest. I tried to enlarge the tip but could not get it clear. If there is only one bevel it was probably not meant to be a skew. Typically used with one hand low, the end of the chisel in the other palm, and the hand against the chest to lean into the work. Just to clean up after other chisels or saw cuts with a shaving no thicker than a hand plane. I still think it may be a paring chisel which was regound as many are tapered over the length as yours is. This is a pic of one from the web. I would think it would work just fine especially for lighter work where you may not want or need a big hoking piece of steel but still want the width for a wider sweet spot. I use a 1” skew most of the time but often a lighter tool would probably work as fine or better. The handle might be a little too sort for a skew. Since they have a tendency to catch, you need that extra leverage. The handle doesn’t look homemade to me, because the ferrule doesn’t look like anything you’d normally have lying around, unless it came off another handle, and because the shape really isn’t that interesting. The length is a bit of an enigma. 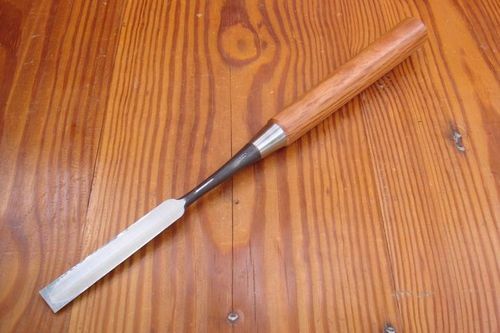 It’s a little short for a turning chisel, but longer than you’d need for carving. I’d lean towards carving though, because the blade isn’t HSS. It could be a paring chisel. Paring chisels come in all shapes and sizes, but usually the blades are thinner and tend to have beveled flanks. There’s a thread on paring chisels at Sawmill Creek with lots of pictures. thanks I see what you mean, it does look line the ones in the saw mill creek thread. If i can get a good grind on it I will rehandle it. the handle is bigger that some. I was looking at a craftsman 1 ” skew at a junck shop, I didn’t get it because the blade is so short, But that handle is quite light.